If you read my menu post last week, then you know I'm attempting to follow a month-long plan. I had planned on doing my grocery shopping for the month, purchasing ingredients for the meals I planned for the next few weeks. That big shopping trip hasn't happened yet, but Joe did pick up a few things here and there that I needed for dinners last week plus some stuff that was on sale for this week. Last week was also the start of a new weightloss challenge that I joined along with a bunch of other bloggers. With all of the weighing, measuring and counting calories it's sometimes easier to eat the same meal several nights a week. That way, I don't have to calculate the calories from the beginning each and every night. So, we didn't have a lot of variety in meals last week. That's okay! We like leftovers! 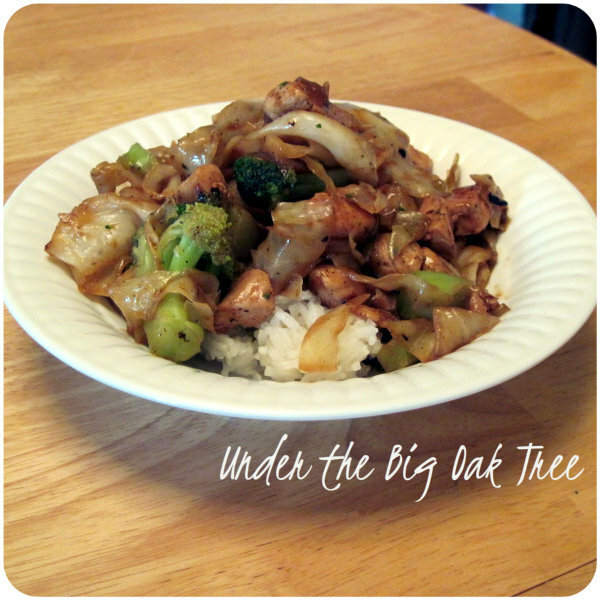 Cabbage Chicken Stir Fry. (Recipe will post on Tuesday.) Mmm! This was not part of June's menu plan, but I had 1/2 a head of cabbage and 2 chicken breast in the fridge that needed to be used up, after a few suggestions from my friend Lisa (her family was eating something similar last week), this is what I came up with and it was amazing and very diet-friendly! We both had this over rice for dinner on Wednesday. I ate the leftovers for both lunch and dinner on Thursday minus the rice! Spaghetti with Meat Sauce. Another meal that wasn't part of the plan. The need for this quick, throw together meal arose when I realized it was 4:30 and I didn't have a clue what to make for dinner! I opened a can of sauce from the pantry and added some frozen, pre-cooked ground beef and let it simmer for about half an hour. I added some crushed red pepper, oregano and garlic and simmered for another 10 minutes. After weighing and measuring, I served over pasta. 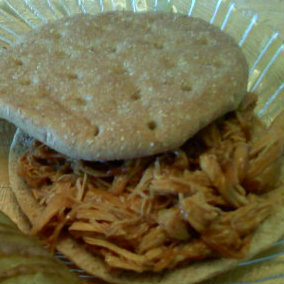 Zesty Crock Pot Shredded BBQ Chicken (recipe review). This meal did actually appear on our menu plan last week! I found this recipe over at the Prickly Banana. It's so delicious and makes a ton! I followed the recipe exactly since it's a simple 3-ingredient meal! (The first link is my review of the recipe, the second link is the original post over at the Prickly Banana!) We enjoyed this for a few nights before freezing the rest for later in the month. Balsamic Chicken over pasta. At Joe's suggestion, I made this simple, delicious meal for Sunday dinner. I really should have taken a photo, but after smelling this recipe cooking (in the crock pot!) all day, I just didn't want to take the time to track down my camera to take a picture. I really couldn't wait to dig in! In fact, while Joe was out, I almost sat down to dinner without him! He pulled in the driveway just as I was just about to grab a dish from the cupboard! We have plenty leftover, so I'm sure we'll have this again one night this week. For this week's menu, I will be working from the same monthly plan as I attempted to follow last week. It will be a hectic and stressful week for us, so I'll be choosing easier meals from the list. We'll be utilizing leftovers as much as possible, too. As much as I like variety, I often find myself eating the same thing week after week just because I know how many calories there are in it and I don't have to spend the extra time looking it all up!